This article is about the Santa Cruz Islands in the Pacific Ocean. For the Santa Cruz Island off the continental United States, see Santa Cruz Island. For the island of the Galápagos, see Santa Cruz Island (Galápagos). The Santa Cruz Islands are a group of islands in the Pacific Ocean, part of Temotu Province of the Solomon Islands. They lie approximately 250 miles (400 km) to the southeast of the Solomon Islands Chain. The Santa Cruz Islands lie just north of the archipelago of Vanuatu, and are considered part of the Vanuatu rain forests ecoregion. 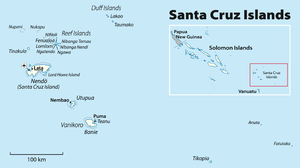 The term Santa Cruz Islands is sometimes used to encompass all of the islands of the present-day Solomon Islands province of Temotu. The largest island is Nendö, which is also known as Santa Cruz Island proper (505.5 km², highest point 549 m (1,801 ft), population over 5000). Lata, located on Nendö, is the largest town, and the capital of Temotu province. Other islands belonging to the Santa Cruz group are Vanikoro (173.2 km², population 800, which is actually two islands, Banie and its small neighbor Teanu) and Utupua (69.0 km², highest point 380 m (1,247 ft), population 848). The Santa Cruz Islands are less than five million years old, and were pushed upward by the tectonic subduction of the northward-moving Indo-Australian Plate under the Pacific Plate. The islands are mostly composed of limestone and volcanic ash over limestone. The highest point in the Santa Cruz Islands is on Vanikoro, 924 m (3,031 ft). The native languages of the islands are classified as the Reef Islands–Santa Cruz languages, within the Oceanic subgroup of the Austronesian language family. Some Polynesian societies of eastern Solomon Islands built ocean-going outrigger canoes known as Tepukei. In 1966 Gerd Koch, a German anthropologist, carried out research at Graciosa Bay on Nendö Island (Ndende/Ndeni) in the Santa Cruz Islands and on Pileni and Fenualoa in the Reef Islands, and returned with documentary film, photographic and audio material. The films that Koch completed are now held by the German National Library of Science and Technology (TIB) in Hanover. He brought back to the Ethnological Museum of Berlin the last still complete Tepukei from the Santa Cruz Islands. In 1971 Koch published Die Materielle Kultur der Santa Cruz-Inseln. The islands were visited by Spanish explorer Álvaro de Mendaña, the first European to sight them, on his second Pacific expedition in 1595. Mendaña started a colony on Nendö which he named Santa Cruz, at the place also named by the Spaniards as Graciosa Bay, and he died there in 1596. During the Pacific War, the Battle of the Santa Cruz Islands was fought north of the Santa Cruz group and some sea planes were based in Graciosa Bay, with one reportedly having sunk there. Chemical ordnance stored on Vanikoro Island was not completely removed until the 1990s. The Santa Cruz Islands were affected by the 2013 Solomon Islands earthquake and subsequent tsunami. The earthquake produced a tsunami measuring 1 metre (3 ft 3 in) at Lata, Solomon Islands, that reached about 500 m (1,600 ft) inland. The airport and low-lying areas were flooded, killing nine people, five of them elderly and one a child. More than 100 houses on the island were damaged, and the water and electricity services were interrupted. It was reported that almost all houses in Nela village were washed away, and some homes in Venga village were shifted by water. ^ "IWF Wissen und Medien". Film Archives Online. Retrieved 5 February 2014. ^ Koch, Gerd (1971). Die Materielle Kultur der Santa Cruz-Inseln (in German). Berlin: Museum fur Volkerkunde Ethnological Museum of Berlin. ^ "Tsunami alert after Solomon Islands earthquake". The Guardian. 2013-02-05. Retrieved 2013-02-05. ^ "Fears for villages after major quake hits near Solomons". Sydney Morning Herald. 2013-02-06. Retrieved 2013-02-05. ^ Suzanne McFadden and Gerry Mullany (2013-02-06). "Tsunami Causes Deaths and Damages Homes on Solomon Islands". The New York Times. Arthur Ochs Sulzberger, Jr. Retrieved 2013-02-06. 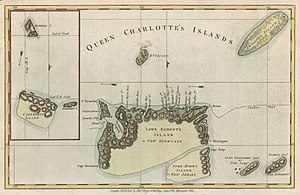 Santa Cruz and the Reef Islands, by W.C. O'Ferrall—1908 account with many illustrations by missionary in Santa Cruz from 1897-1904. Wikivoyage has a travel guide for Santa Cruz Islands. "Santa Cruz, an archipelago of the Pacific Ocean, in the division of Melanesia" . Encyclopædia Britannica (11th ed.). 1911. "Santa Cruz Islands" . New International Encyclopedia. 1905.